We are on a bit of a health kick at the moment - A in particular, as he's worried about the couple of pounds of Christmas paunch that went on as a result of a couple of weeks of good food and booze. Consequently, A isn't drinking for January (though this isn't so hard as he isn't a huge drinker anyway), and is looking for ways to eat a bit more healthily to complement a slightly increased exercise regime. Imagine the joy therefore when C pointed out that the pulled pork ham hock sold as part of the "Cooks Ingredients" range in Waitrose contained only 123 calories per portion, and had a low salt and fat content. A almost jumped for joy after a week of vegetables. As it was late and both A and C were starving, A suggested using the pulled pork, along with other things, for sandwiches. However, we couldn't reach a consensus on how exactly to make them, so other than ciabatta and pulled pork, we went our separate ways on the fillings. The results were two completely different offerings: one more American than the other, but both delicious. 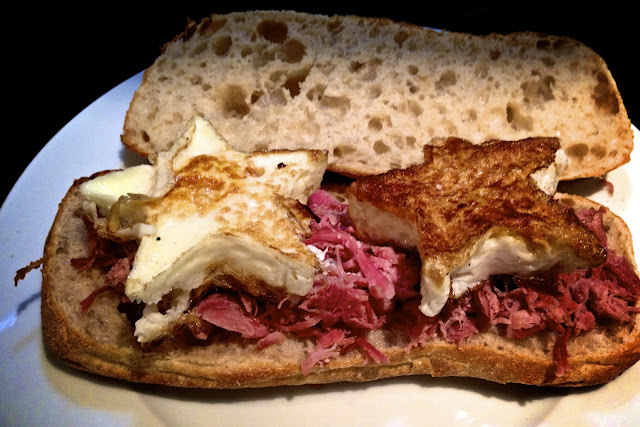 C's inner child is as vociferous as A's, so she opted to experiment with producing a pulled pork sandwich which appealed to the infant inside with a fun twist on ham and eggs. C toasted her ciabatta bread, and warmed through the pulled pork with a twist of salt and pepper. In another pan, C heated some cooking oil and fried two eggs, which she formed into perfect stars. She did this by taking a star shaped cookie cutter and placing it in the centre of the pan in the oil, cracking the egg into the cookie cutter and letting it fry inside. 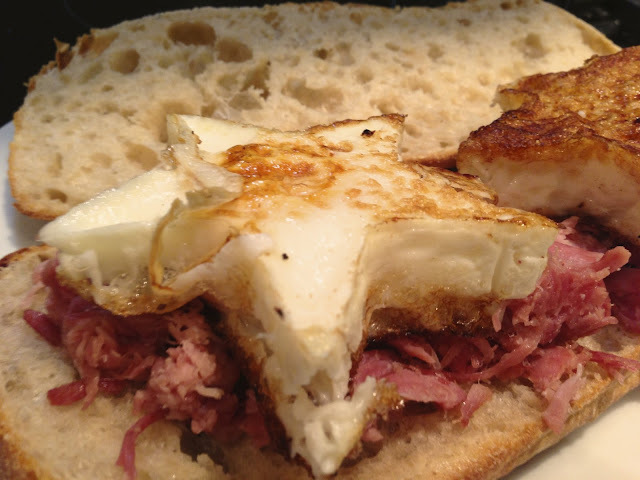 The result was that two eggy stars sat atop the meat inside the sandwich, producing quite a fun effect. The stars were a bit of an experiment, which A thought might be fun, and we are pleased to report that while our first attempts came out a little singed, they did work. 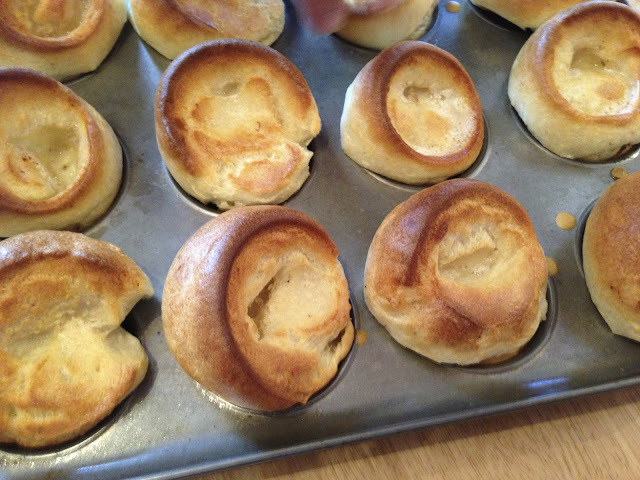 C reports that they were actually quite delicious but heed the warning to coat the inside of the cutter with oil to avert washing up hell. C was very pleased that the yolks hadn't broken, and loved how they ran into the pork and through into the warm bread underneath. It was definitely the most aesthetically pleasing light dinner she'd had in a while. Even though it was very simple, it really hit the spot. 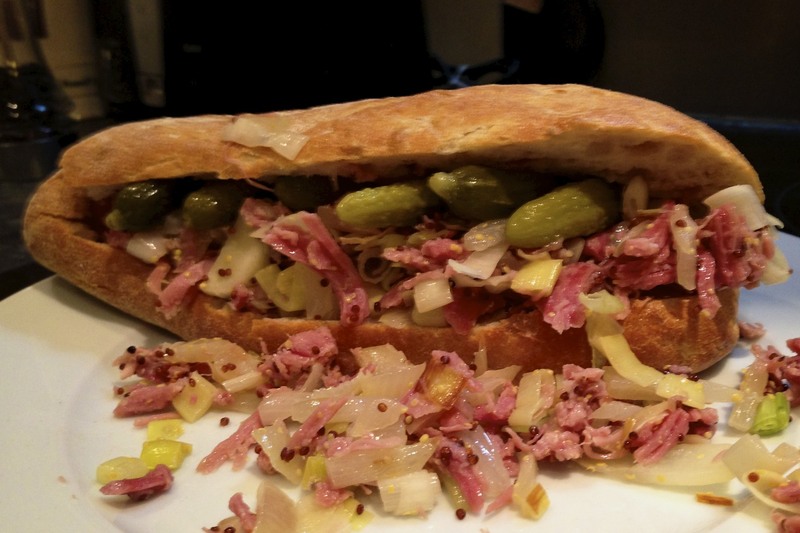 A went for an altogether more macho option for his sandwich of pork, leek, onion and mustard. He softened half an onion and half a leek in a smidgin of sunflower oil, and then threw in his half of the pulled pork with a teaspoon of French wholegrain mustard and a twist of salt. He then let this heat through until the pork was warm and the vegetables soft. 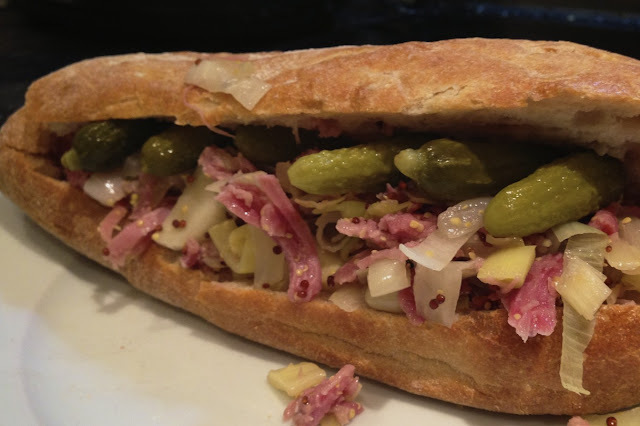 Finally, he stuffed the results into his ciabatta with a few pickles and hey presto, manwich! The flavours were more delicate than A was expecting. The wholegrain mustard was used sparingly and added a sweetness rather than heat to the dish. Similarly, the use of the leek mellowed some of the onion's harshness, meaning that it wasn't overpowering and the flavour of the pork really came through. It was also the first truly substantial meal that A had had in about a week, so he was particularly pleased with the results. For a light dinner, this wasn't the cheapest thing we've ever done, in part because A bought the most expensive pickles on earth and we were doubling up on ingredients in a way you wouldn't need to do if you were doing but one option. However, we reckon that if you didn't do a super pricey Waitrose shop you could produce either sandwich for a few pounds: the most expensive part really being the pulled pork, which costs something like £2.50 for a packet to feed two. And there you have it: an indulgent sounding light bite for a weeknight.